Mirwaiz Umar Farooq addressing a gathering at historic Aali Masjid in Srinagar on Sunday. On the occasion of 48th death anniversary of Mahajr-e-Millat, Mirwaiz Moulvi Yousuf Shah, Hurriyat (m) chairperson, Mirwaiz Umar Farooq Sunday vowed to continue his mission till the lasting and permanent solution of Kashmir issue is not found in accordance with aspirations of the people of Kashmir. According to an amalgam statement, paying rich tributes to Shah for his commitment towards movement, politics, society and religion in Kashmir, Mirwaiz stated the contributions of Mahajr-e-Millat were unmatchable. “The sacrifices of the late Mirwaiz and Lakhs of other people was priceless asset with the Kashmiri nation. 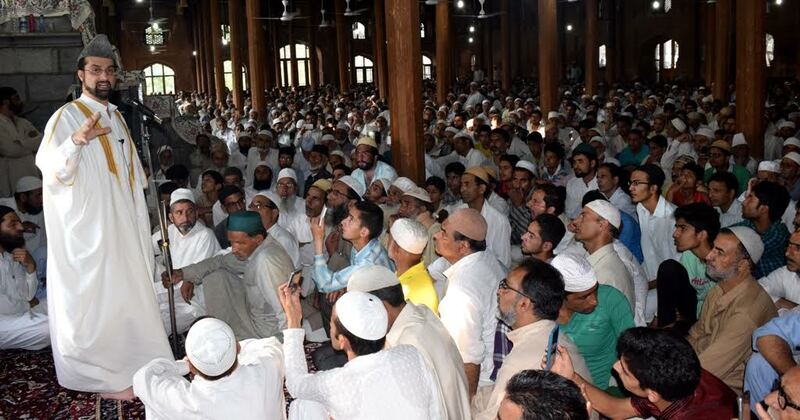 The sacrifices united the whole nation so as to fight for right to self determination which is continuing even today,” he said while addressing a gathering at historic Aali Masjid in Srinagar. 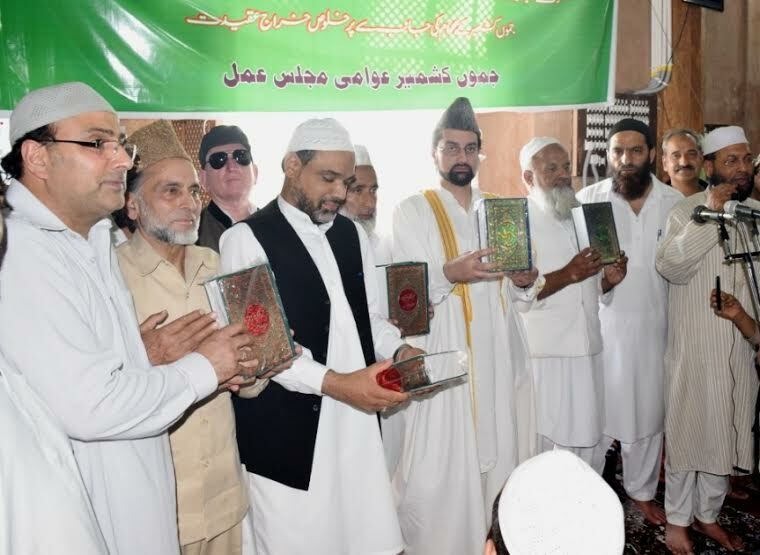 Valley’s chief cleric, Mirwaiz Umar Farooq, releasing Kashmiri Tafseer of The Holy Quran – Bian-Ul-Furqaan – authored by the Mahar-e-Millat Mirwaiz Yousuf Shah on Sunday at historic Aali Masjid in Srinagar. Mirwaiz also released a new edition of the Kashmiri Tafseer of The Holy Quran – Bian-Ul-Furqaan – authored by the Mahar-e-Millat Mirwaiz Yousuf Shah on the occasion.